What better way to celebrate Mother's Day than watching the new comedy of the same name, with 100 of your friends? Enter to win via Boppy’s Facebook Page from April 14 to 23, and you could be the lucky winner and get a private screening in your hometown's theater! Take your own mom, spouse, or all of your Mommy Friends and get ready to laugh your hearts out with the star-studded cast which includes Julia Roberts, Jennifer Aniston, Kate Hudson and Jason Sudeikis! Get front-row seats for you and 100 of your closest friends at your own private screening of the highly-anticipated, star-packed romantic comedy Mother’s Day with Boppy in your hometown theater. 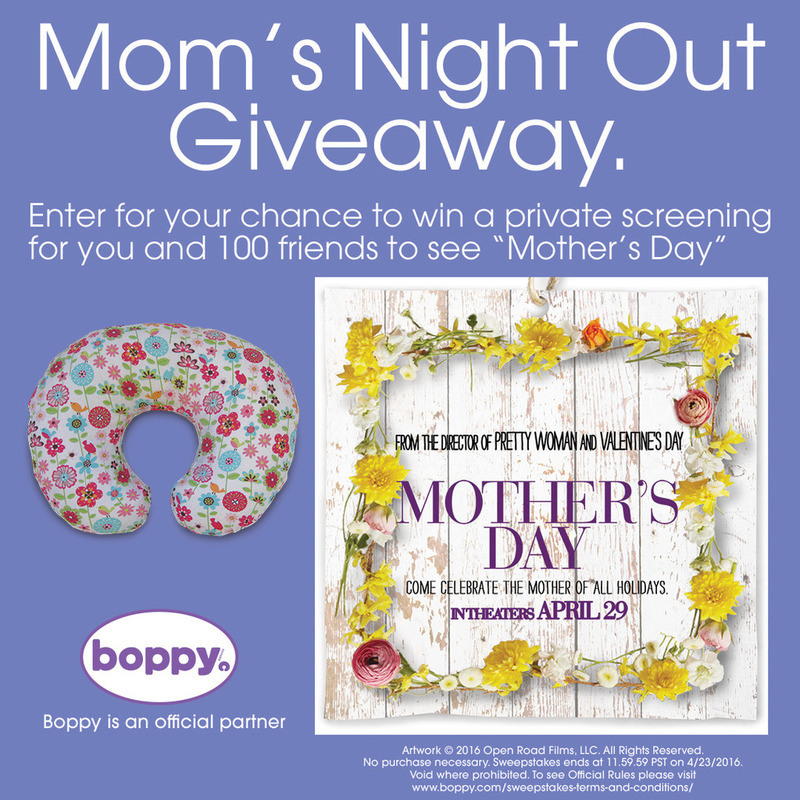 Celebrate motherhood with Boppy’s special sweepstakes that will let some lucky moms get a private viewing of the hilarious new movie. The Boppy Pillow – the original, award-winning, proven, washable Nursing Pillow – is a versatile star of its own and The Boppy Company is excited to announce that they are an official partner of Mother’s Day which is opening in theaters on April 29. 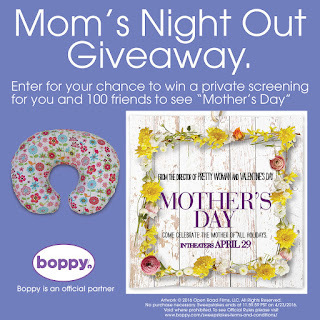 Moms who enter the Boppy Mom’s Night Out Sweepstakes via Boppy’s Facebook Page from April 14 to 23 will have the glamorous chance of becoming one lucky grand-prize winner to have a private screening of the Mother’s Day at her local movie theater for herself and 100 friends. Ten runners up will win four tickets to see the movie. Directed by comedy-favorite Garry Marshall, the director of Valentine’s Day and Pretty Woman, the star-packed Mother’s Day, weaves intertwining, funny stories about the lives of several mothers as the May holiday approaches. Founded in 1989, The Boppy Company is the world leader and expert in creating comfortable, supportive and award-winning products for mom and baby. To date, Boppy Products have won over 50 awards and continue to be named must-have products around the world. Most well known as the maker of the world’s original nursing pillow, the iconic Boppy Feeding and Infant Support Pillow, The Boppy Company has expanded into skincare, pregnancy pillows, breastfeeding accessories, baby loungers, baby clothing, plush goods, baby travel products, nursery products and baby seats. For more information, visit www.boppy.com. The Boppy Company is a wholly-owned subsidiary of The Artsana Group, www.artsana.com.